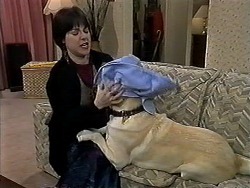 Dorothy arrives and tells Josh he's going to be punished. Josh says he decided that he changed his mind and it wasn't fair on the mice. DOROTHY: Surely you realise how vital vivisection is for scientific research? JOSH: We're not talking about scientists; we're talking about a bunch of blood thirsty school kids being encouraged to cut up live mice just to see how they tick. DOROTHY: How else are students meant to learn? JOSH: Books and that…do we have to use the real thing? Dorothy says Josh must feel strongly but there is no excuse for his actions, Josh said he let the mice run away so Dorothy has to call vermin control! Toby lets the frogs out into the lake. 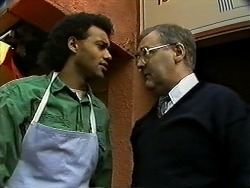 TOBY: Remember, stay away from Erinsborough High and French restaurants. 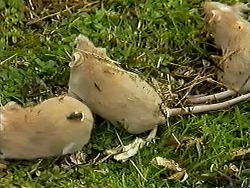 He also lets the mice out but Kerry isn't happy, Kerry says that this isn't their natural habitat but there are still some left that Melissa will look after. She feels she wasn't successful as no one agreed with her; Kerry reassures her that she would have made some kids think. Joe is trying to sell a car alarm to Eddie but he isn't interested as he doesn't have a car! Joe has nine of them to sell, Eddie thinks it's dodgy but Joe says it's kosher. Eddie agrees to try and sell some in The Waterhole as long as they split profits. Madge and Helen discuss Gemma and Matt, Helen thinks the one year age gap is fine. Beverly and Des return for her hearing after she slapped her patient, she has been suspended but she doesn't have to go to court on assault charges, the mother she hit dropped the charges. Eddie tries to sell Melissa and then Josh the car alarm! Josh tells Melissa about him being caught in the Science Lab and how he was there to release the mice. Melissa is confused; she doesn't believe him and thinks he only did it so they could go out. MELISSA: And next time you take credit for something I do, don't bother. JOSH: Credit? I thought I was taking the blame. Melissa is telling Kerry about Josh, Kerry thinks he was sweet for taking the blame but Melissa is angry. Josh arrives and Kerry decides that she will tell Dorothy the truth, Melissa walks into Josh who walks out after Melissa calls him a pig! Kerry defends Josh again. Joe gives Eddie some profits from the car alarm, Madge isn't keen on Eddie selling them at the pub, and Harold thinks they are stolen until he hears the price! Eddie gives him a hard sell and he decides to buy one. Beverly is listing all the things she can do while she is suspended including golf and pottery! She is clearly trying to convince herself that she will not miss the surgery, Helen doesn't look convinced. Des is talking to Kerry who is complaining that Joe is always out, Joe and Eddie return with more car alarms and tries to sell one to Des but he is selling his car. Eddie says he would get a higher price if it had an alarm in. Outside a car alarm starts and Joe thinks a burglar is on the loose! Madge thinks the car alarms are dodgy as Harold rushes out to tackle the thieves! Outside Joe, Des and Eddie are by the car as Harold runs up carrying a weapon! He lets Joe into the car so he can turn it off. Helen wonders what all the noise is about. Joe can't turn the alarm off, Bouncer and Rosie are barking like mad! Joe opens the bonnet but needs a key to disconnect the alarm. 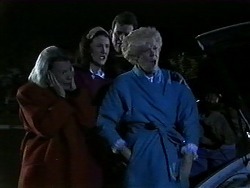 An annoyed Helen and Dorothy approach, Des tells them what has happened. Harold finds the key needed but Joe snaps it in the lock! DOROTHY: You do know that you are breaking noise pollution rules? Joe runs off to get his tools as he can't disconnect the battery. Kerry is putting ear plugs in Toby as Joe arrives to collect his tools! MADGE: Why can't you stop it? HAROLD (Thumping the bonnet): We are experiencing a slight technical hitch, my love! MADGE: I warned you that anything bought from Joe will turn out to be a load of old rubbish. 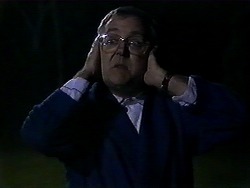 DOROTHY: I wish he'd listened to you, this noise is worse than Chinese Water Torture! MADGE: Oh for heaven sake's Harold! Stop it before you wake up the whole of Erinsborough! HAROLD: Joe is the expert. MADGE: Right, where is he? DES: He's gone to get some tools. MADGE: Typical, he's never here when you need him. Madge tells Harold to drive to the park and stay there until the alarm is fixed, she sends Eddie with him as he's also to blame! Harold nearly runs the ladies over as they drive away; Joe turns up too late and wonders where everyone is. Joe has found Harold who is still very unhappy, the alarm is then turned off but as Eddie leans on the horn it becomes jammed and is making more noise! Harold wants a refund for the alarm but Joe is having none if it. Eddie wants Harold to make a sandwich but he can't hear anything because of last night. Josh is at a table and Melissa joins him, she says Josh can have an opinion, he hasn't changed his mind about vivisection though and Melissa gets up to leave. Josh says they can agree to disagree. Kerry tells Dorothy she released the animals, she won't name the students involved. Kerry says she will pay for any damage, Dorothy says she will be phoning the police.